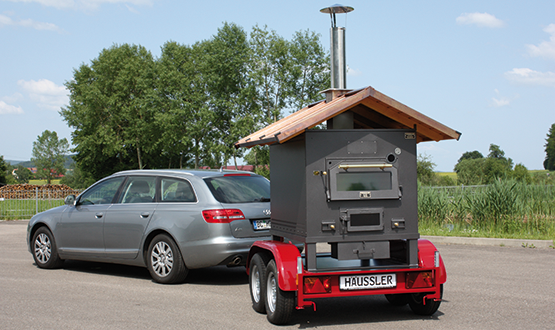 The HÄUSSLER BakeMobiles are individually and stand out anywhere. As a result, they are of course a perfect advertising medium! The large number of bakeries doesn’t make it easy for a baker to achieve and maintain good sales figures. Only someone who can prove themselves to be innovative and resourceful has a chance in a competitive environment. tarte flambée and bread from the wood-burning oven can develop a high degree of recognition for their bakery in addition to new sales markets. in front of your branch shop etc. Flexible, customised and striking. A perfect advertising medium! 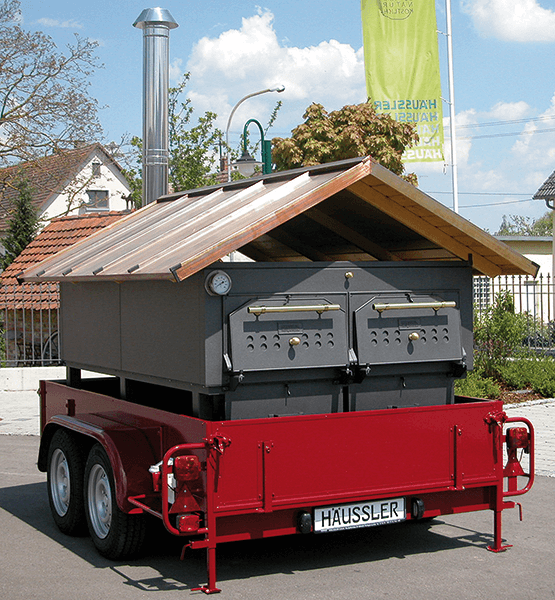 A HÄUSSLER BakeMobile is manufactured with the highest quality materials. Of best quality with a long service life! Thick full fireclay lining = high heat storage capacity, few re-heating phases. Heat up at home, bake on site. Distinction of the original wood-burning oven. Registration as a mobile working machine = tax-free operation in Germany! The two-axle tandem trailers are specially designed for transporting the wood-burning ovens, have an optimum axle load distribution, are smooth-running and have a high degree of riding comfort. BakeMobiles are striking advertising media. This means that you are close to the customer and are capitalising on additional income opportunities. 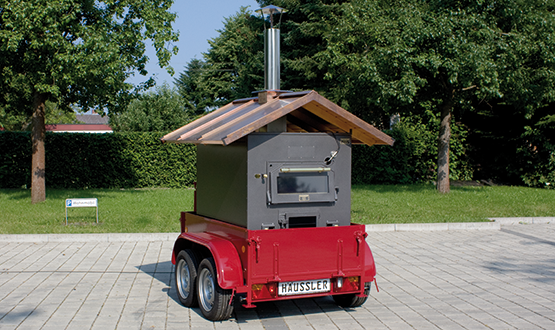 The BASIS BakeMobile consists of the wood-burning oven DEBO 60.100, which is installed on a 1.6 t tandem trailer. A gable roof with copper fittings and a stainless steel flue pipe with rain protector are installed on the oven. The oven comes with a thermometer for inserting, internal illumination and an ash removal rake. The frame and chassis of the tandem trailer are galvanised. It also has an auto-reverse system, a height-adjustable support wheel and two rear supports that are built into the frame. The standard paint colour for the Häussler trailer is red (RAL no. 3004). If desired, paint finishes in your company’s colours are possible. The Basis Plus BakeMobile is equipped like the BASIS BakeMobile. In addition, the tandem trailer has 40 cm high side walls. Front and rear flaps can be folded, and the rear flap can also be removed. The BASIS PLUS L BakeMobile is in addition equipped with a storage box painted black and a larger roof. The tandem trailer is designed for 2.0 t.
The STANDARD BakeMobile has a larger 2.0 t tandem trailer than the BASIS PLUS BakeMobile. Its large, hinged gable roof is constructed on the trailer and can be easily folded down after use and for driving. As additional equipment, you can get fold-down stainless steel work surfaces that are installed on the trailer. supports for a sunshade. On request, you can get the BakeMobile with a portable sink, including hose connections or with a water tank. You can also obtain from us sunshades, awnings and protective curtains. 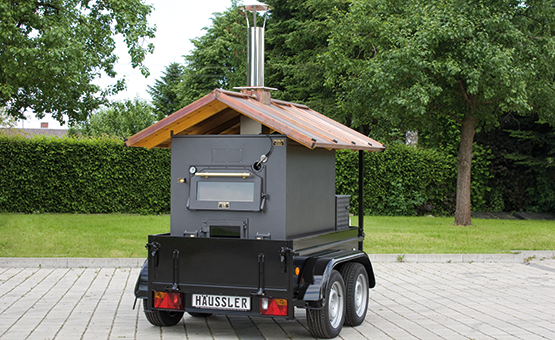 These BakeMobiles are equipped with an original old German wood-burning oven. It is therefore directly heated in the baking chamber and then baked with decreasing heat. That is why this model series is especially suited for baking classic bread from a wood-burning oven. If the oven should be used for items baked for a short time, the baking chamber is not completed cleaned, but rather a portion of the embers is pushed to the side. This means that the heat in these ovens can also be kept constant throughout the baking time. 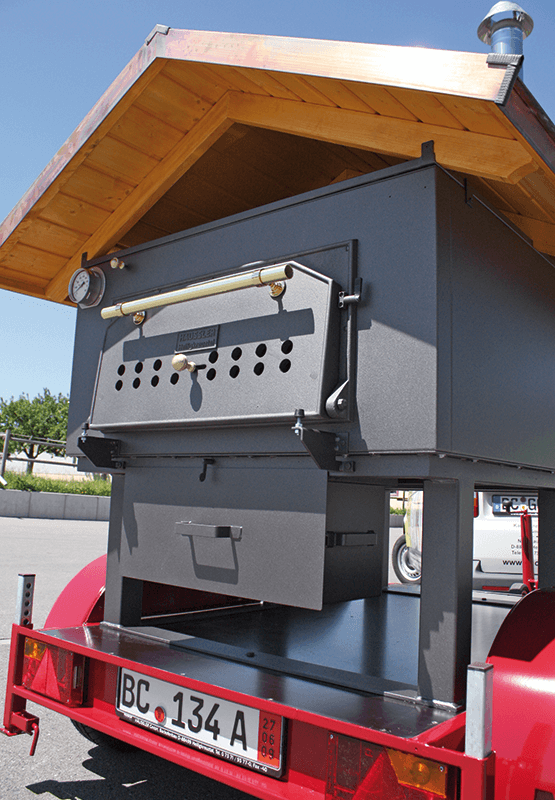 You are welcome to receive our wood-burning ovens with a mounting frame for self-installation on an existing trailer. The trailer must however be approved by by the German Technical Inspection Association (TÜV) for self-installation as well. 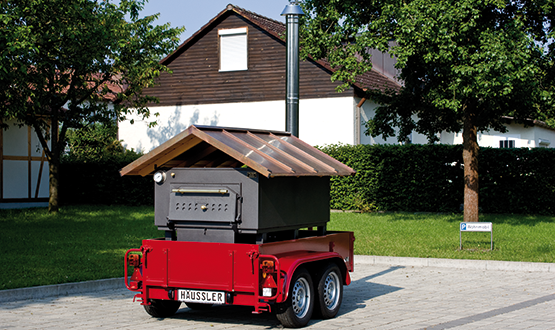 HABO 15 AH BakeMobile: Wood-burning oven HABO 15 installed on tandem 2.0 t trailer with support wheel in front, 2 parking supports in the rear, galvanised frame, foldable side walls in the front and rear, complete with copper roof, stainless steel flue pipe, with rain protector and mounting bracket. 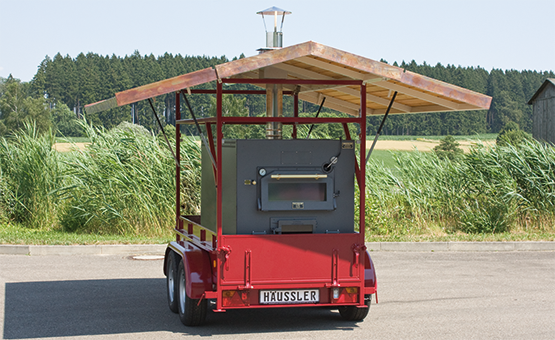 Wood-burning oven HABO 20 installed on tandem 2.0 t trailer with support wheel in front, 2 parking supports in the rear, galvanised frame, foldable side walls in the front and rear, complete with copper roof, stainless steel flue pipe, with rain protector and mounting bracket. 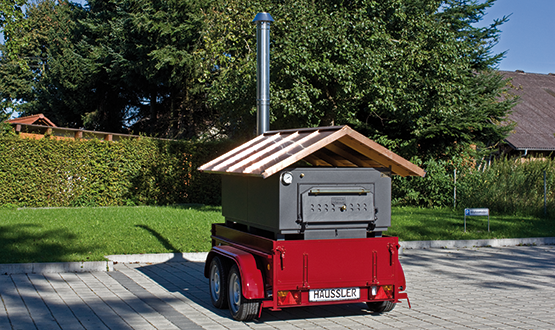 Wood-burning oven HABO 30 installed on tandem 3.0 t trailer with support wheel in front, 2 parking supports in the rear, galvanised frame, foldable side walls in the front and rear, complete with copper roof, stainless steel flue pipe, with rain protector and mounting bracket. 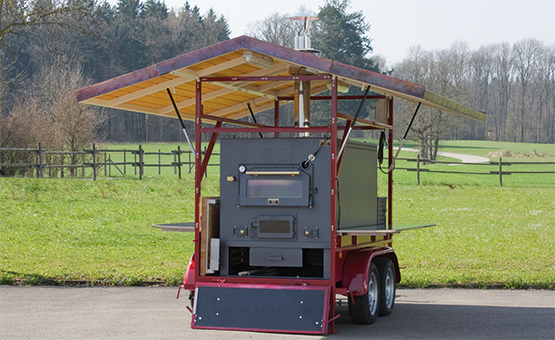 With the mobile wood-burning oven concept, we provide you a complete package for your street trading. 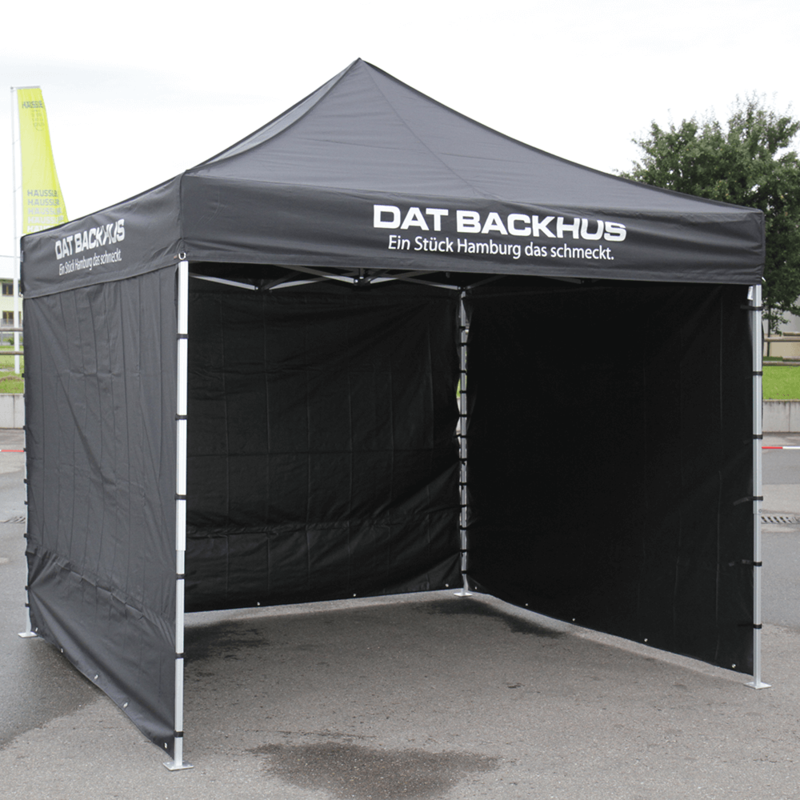 In addition to the BakeMobile, you will receive from us a sales pavilion and a hygiene station. The pavilion can be imprinted according to your own wishes and ideas or you will receive appropriate print templates from us. Attractively imprinted, easy and quick set-up. 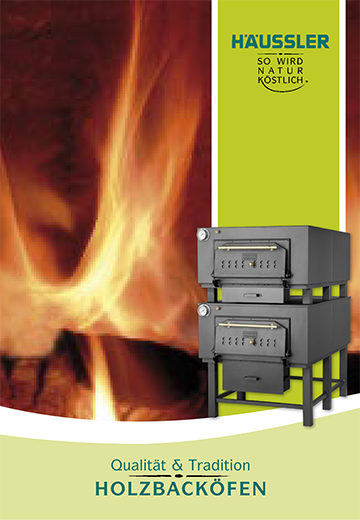 You will find everything about the world of the wood-burning oven in our brochure. Presented there are not only the BakeMobiles, but also the HABO series, wood-burning oven kits, the HABOMAT pellet oven and our DEBO continuous wood-burning oven. The correct marketing for using a wood-burning oven is also explained.